Powers/Abilities: A ruthless tyrant, Lord Sett appeared to have the average strength-level of a man of his age and build, and he displayed no paranormal abilities. Lord Sett wore a helmet, and he had an unspecified form of handgun holstered on his waist. He commanded military forces with advanced technology, including a fleet of spaceships armed with atomic weapons. History: (Journey into Unknown Worlds I#37/2 (fb) - BTS) - The past of Lord Sett is unrevealed, but he eventually became the dictator of his planet. Considering himself to be the greatest of all, Sett decided he should therefore rule all, and his lust for power drove him to extend his dictatorship throughout the galaxy. He dispatched a scout ship to deliver a challenge of battle to his opponents, the forces of the Galaxy Command. (Journey into Unknown Worlds I#37/2) - As he sat upon his throne in his palace, Lord Sett was approached by his scientist. The elderly man of science told Sett that his plans to start atomic wars were madness, and he warned him that the planets themselves would move and destroy their homeworld if Sett didn't stop; but Sett merely scoffed at the claim and ordered the old man to return to his laboratory. When the scout ship returned, the pilot reported to Lord Sett that the Galaxy Command had accepted his challenge, for their spaceships were currently orbiting above and awaiting battle. Greatly pleased, Sett ordered all of his warships to attack and to show no mercy. A fierce battle ensued between the dictator's armada and the opposing fleet, with Lord Sett's forces ultimately victorious. 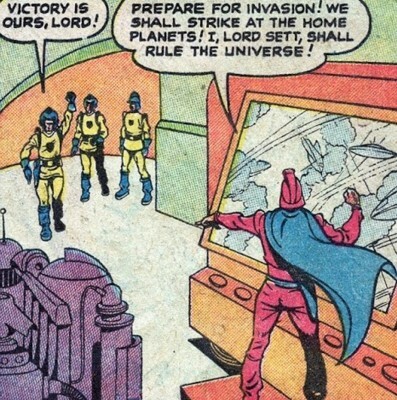 Sett then ordered his troops to prepare for an invasion of the home planets of the Galaxy Command. 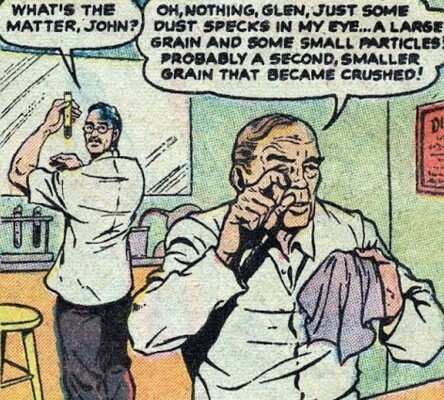 At that exact second on Earth, in a research laboratory in New York City, two scientists--Glen and John--were working. Glen noticed John rubbing his eye and asked him what was the matter; but John insisted it was nothing--he just had some dust specks in his eye. Then John theorized that since size was relative, maybe specks of dust were actually tiny worlds much like Earth; and by the same process of thought, John further speculated that perhaps Earth itself was only a speck of dust in the eye of some being so huge that humans could not even conceive of him. Glen told him it was a nice theory, but nobody was listening to scientists...especially now, when the whole world was thinking about nothing but atomic war. Comments: Created by an unidentified writer and an unidentified artist. 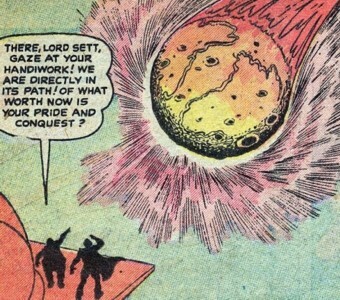 So from the story's ending, I guess we can infer that Lord Sett's world was just a dust-mote in John's eye--according to modern Marvel pseudo-science, that means it was actually a planet in the extradimensional Microverse. This ironic surprise-ending (the all-powerful alien conqueror revealed to actually be tiny and insignificant in comparison to Earthlings) would later be used for such characters as Tim Boo Ba, Monsteroso, and the Goloks. 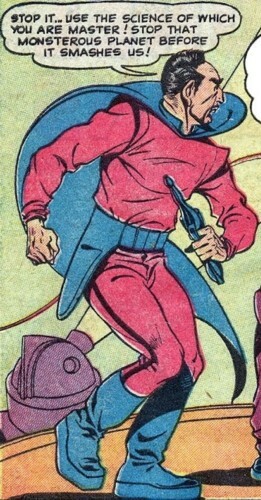 In regards to the issue number: Although the cover has this numbered as issue #37, this was actually the second issue of Journey into Unknown Worlds. 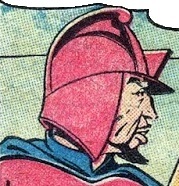 This series began in 1947 as Teen Comics, which featured humorous stories from #1 until #35; then it underwent a format change to fantasy/science-fiction and was retitled Journey into Unknown Worlds with issue #36, and continued until #38, after which the numbering was adjusted and the next issue continued with #4 onward (I mention all this because another issue #37 later appeared, dated September, 1955). There were no clear full-frontal headshots of Lord Sett available, so the best I could do was a side-view (It was only a 3-page/15-panel story, so you've already seen about 50% of it with just this profile!). A fortress on an unidentified planet, it was located in a metropolitan area. It was Lord Sett's headquarters, where he made his plans for galactic conquest. Lord Sett's chief scientist, he was not afraid to speak his mind to the dictator. 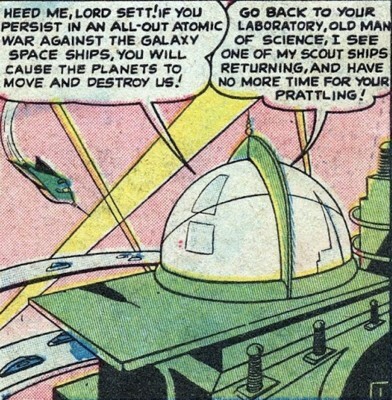 He tried to warn Sett to stop his plans for atomic warfare, because he feared that it would cause the planets themselves to move and destroy their homeworld. But Sett didn't believe him, so he ordered the elderly scientist to return to his laboratory. The scientist later alerted Sett that his prediction came true when a monstrous planet had been knocked out of its orbit and was headed straight for their world. He was standing beside Lord Sett on the palace balcony when the runaway planet approached, and he told the dictator that he welcomed the impending disaster because Sett had corrupted their people and their world. He presumably died when the monstrous planet collided with their world and destroyed it. 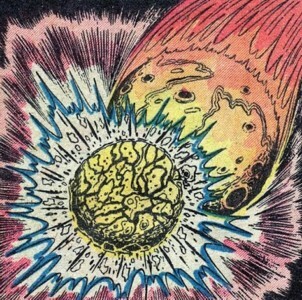 A large unidentified planet, it was knocked from of its orbit as a result of Lord Sett's atomic war; it eventually collided with Sett's homeworld and destroyed it. Two scientists who worked at a research laboratory in New York City. 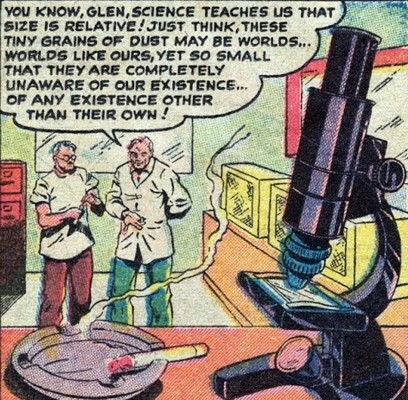 One day, John was rubbing some dust specks from his eye, and he proposed the notion to Glen that perhaps dust specks were actually tiny worlds much like Earth.